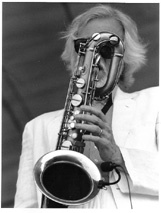 Newport Jazz Festival, Rhode Island, 1990, and the ever present Gerry Mulligan Quintet had the crowd cheering and dancing. Mulligan was still around after 50 years of playing, doing too many drugs (in his youth) staying the course and having as much to say through his horn at 65 as he did at 25. What an accomplished musician.